We were visiting Canandaigua this past fall and happened upon the farmers market. 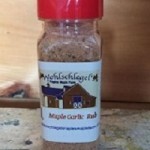 We bought a jar of the maple cream and it has been DELICIOUS on toast or english muffins!!! 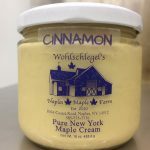 If you can’t wait for another visit, give us a call and we will be happy to ship you some more maple cream spread! We appreciate your comment and your business. We are in love with this Mapel Cream. A family member brought some to our Thanksgiving dinner! It’s the best thing in the world! Thank you so much Ana! Bought a jar at the grape festival and then another jar at Fall Foliage. My absolutely favorite thing ever. would / could this be put in coffee? or do you have another product that could be used to sweeten and be an alternative to cream?